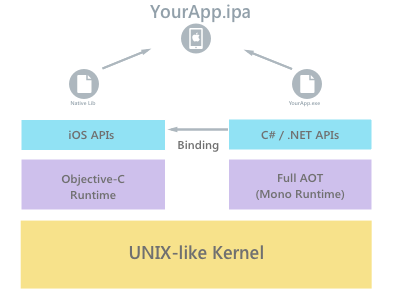 Xamarin.iOS applications run within the Mono execution environment, and use full Ahead of Time (AOT) compilation to compile C# code to ARM assembly language. This runs side-by-side with the Objective-C Runtime. Both runtime environments run on top of a UNIX-like kernel, specifically XNU, and expose various APIs to the user code allowing developers to access the underlying native or managed system. When developing for Xamarin the terms native and managed code are often used. Managed code is code that has its execution managed by the .NET Framework Common Language Runtime, or in Xamarin’s case: the Mono Runtime. This is what we call an intermediate language. Native code is code that will run natively on the specific platform (for example, Objective-C or even AOT compiled code, on an ARM chip). This guide explores how AOT compiles your managed code to native code, and explains how a Xamarin.iOS application works, making full use of Apple’s iOS APIs through the use of bindings, while also having access to .NET’s BCL and a sophisticated language such as C#. When you compile any Xamarin platform application, the Mono C# (or F#) compiler will run and will compile your C# and F# code into Microsoft Intermediate Language (MSIL). If you are running a Xamarin.Android, a Xamarin.Mac application, or even a Xamarin.iOS application on the simulator, the .NET Common Language Runtime (CLR) compiles the MSIL using a Just in Time (JIT) compiler. At runtime this is compiled into a native code, which can run on the correct architecture for your application. With Xamarin, we have two separate ecosystems, .NET and Apple, that we need to bring together to seem as streamlined as possible, to ensure that the end goal is a smooth user experience. We have seen in the section above how the two runtimes communicate, and you may very well have heard of the term ‘bindings’ which allows the native iOS APIs to be used in Xamarin. Bindings are explained in depth in our Objective-C binding documentation, so for now let’s explore how iOS works under the hood. First, there has to be a way to expose Objective-C to C#, which is done via Selectors. A selector is a message which is sent to an object or class. With Objective-C this is done via the objc_msgSend functions. For more information on using Selectors, refer to the Objective-C Selectors guide. There also has to be a way to expose managed code to Objective-C, which is more complicated due to the fact that Objective-C doesn’t know anything about the managed code. To get around this, we use Registrars. These are explained in more detail in the next section. For all classes that are not wrapping an existing Objective-C class, it creates a new Objective-C class with Objective-C members mirroring all the managed members that have an [Export] attribute. In the implementations for each Objective–C member, code is added automatically to call the mirrored managed member. The managed code can contain the attributes, [Register] and [Export], that the registrar uses to know that the object needs to be exposed to Objective-C. The [Register] attribute is used to specify the name of the generated Objective-C class in case the default generated name is not suitable. All classes derived from NSObject are automatically registered with Objective-C. The required [Export] attribute contains a string, which is the selector used in the generated Objective-C class. Dynamic registrars – The dynamic registrar does the registration of all types in your assembly at runtime. It does this by using functions provided by Objective-C’s runtime API. The dynamic registrar therefore has a slower startup, but a faster build time. This is default for the iOS Simulator. Native functions (usually in C), called trampolines, are used as method implementations when using the dynamic registrars. They vary between different architectures. For more information on the specifics of the iOS Type Registration system used by Xamarin.iOS, refer to the Type Registrar guide. The entry point of all Xamarin.iOS executables is provided by a function called xamarin_main, which initializes mono. 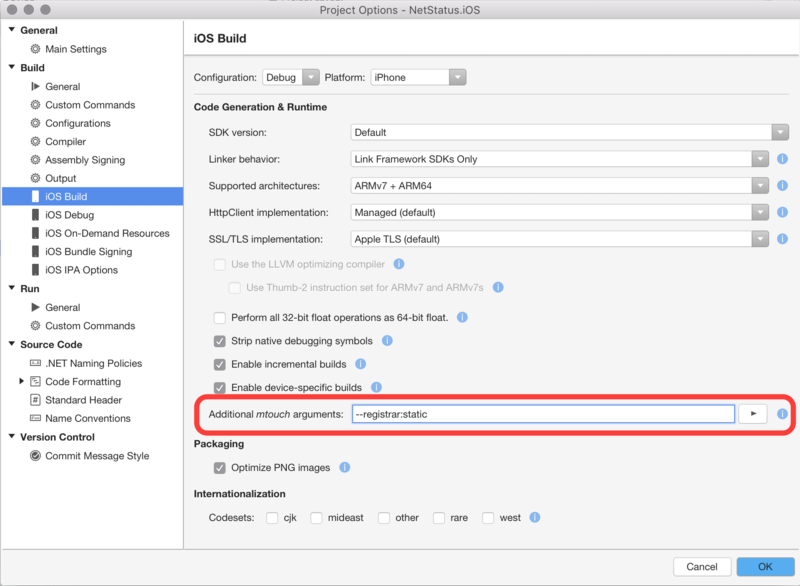 For regular iOS and tvOS applications, the managed Main method, provided by the Xamarin app is called. This managed Main method then calls UIApplication.Main, which is the entry point for Objective-C. UIApplication.Main is the binding for Objective-C's UIApplicationMain method. For extensions, the native function – NSExtensionMain or (NSExtensionmain for WatchOS extensions) – provided by Apple libraries is called. Since these projects are class libraries and not executable projects, there are no managed Main methods to execute. All of this launch sequence is compiled into a static library, which is then linked into your final executable so your app knows how to get off the ground. At this point our app has started up, Mono is running, we are in managed code and we know how to call native code and be called back. The next thing we need to do is to actually start adding controls and make the app interactive. The Generator, called btouch in Xamarin.iOS, takes these definition files and uses .NET tools to compile them into a temporary assembly. However, this temporary assembly is not useable to call Objective-C code. The generator then reads the temporary assembly and generates C# code that can be used at runtime. This is why, for example, if you add a random attribute to your definition .cs file, it won’t show up in the outputted code. The generator doesn’t know about it and therefore btouch doesn't know to look for it in the temporary assembly to output it. Once the Xamarin.iOS.dll has been created, mtouch will bundle all the components together. Create an app bundle structure. Copy in your managed assemblies. If linking is enabled, run the managed linker to optimize your assemblies by ripping unused parts out. For more detailed information on the linker and how it is used, refer to the Linker guide. This guide looked at AOT compilation of Xamarin.iOS apps, and explored Xamarin.iOS and its relationship to Objective-C in depth.